We’d love your help. 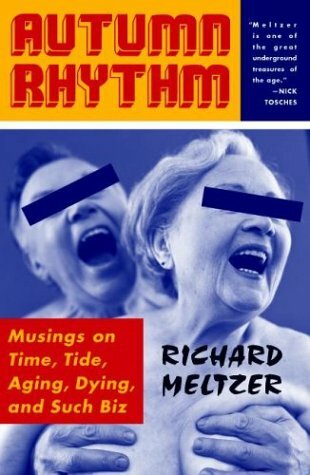 Let us know what’s wrong with this preview of Autumn Rhythm by Richard Meltzer. To ask other readers questions about Autumn Rhythm, please sign up. If you are a fan of Meltzer's idiosyncratic style, this may appeal to you more than it did to me. I enjoyed some of his ruminations on aging--especially as they come from an influential voice in music writing and criticism--but I find it difficult to get past the quirks of spelling and punctuation that he employs. I'm sure I simply am not, as his fans might suggest, rock 'n' roll enough to get it. So be it. Some of this was a little too oh-I'm-cynical as a cover for the pain of getting old and frankly got on my nerves. All was forgiven/redeemed by pp. 24-29, where he writes about taking care of his 17 year old cat. Even if I was not a cat person, I'd be MOVED. For the Meltzer neophyte, this would not be a bad place to start. occasionally funny but mostly annoying, self-impressed essays in which the author reminds you constantly how he's middle-aged but still cool, is true to his muse as a writer with integrity and not a sell-out, etc. etc. I hope I don't come across this way to my students. Recommends it for: Anyone approaching landmark birthdays. I wander back to this from time to time - it's real good, but maybe too close to home. Count on Richard to write a book full of truths too uncomfortable to be read by the target audience. This has me thinking I should reread The Night Alone again. Found this cheap on paperback and roared through it. I missed out on reading it when it first came out so I'm glad I found it. Richard Meltzer is pretty much my favorite writer. This isn't his best book but it reminded me of why I love him. Well worth reading even if you aren't a gimp. A somewhat rambling account of popular culture by a writer who talks about music and poetry interspersing autobiographical reflections on aging with his opinions about various artists. The language is a mixture of the vulgar and profound. A collection of rants and rage of a rock and roll geezer. An amusing revelation of a cool curmudgeon. His cuckoo writing style is fresh, despicable and entertaining. Rock critic, performer and writer. He is considered by some rock historians to be the first to write real analysis of rock and roll and is credited with inventing "rock criticism".